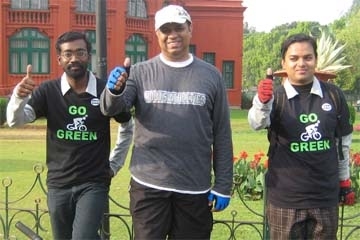 GoGreen Campaign Ride towards Cubbon Park 14 Mar 2010 - GGI-Group size: 4000+ Professionals, Increasing on day to day basis, Come & join us 2 serve Mother Nature. We had 2 new GGI's, Senthil (Madiwala) & Ganesh (Koramangala) Since being a long weekend (4 days) most of the people were out of station. 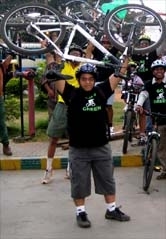 however we started off by 6:45 from RIS junction & reached Cubbon park by 7:30am. 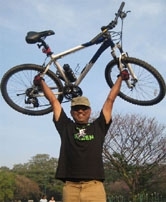 Meanwhile, Ashwath who joined us to try out cycling and was cycling after 10 long years hence advised to peddle slowly so as to get use to it. he came along with the group till Jaynagar 4th Block (which is roughly around 8 Km 4+4 ) their after asked him to take a U turn so that he could reach home with out any cramps. Ashwath & Sushma both couple staying in BTM Layout decided to Go Green & were referred by Shilpa. 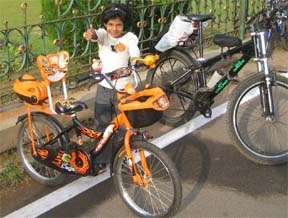 Sushma had decided on Merida while Ashwath wanted to tryout different cycles then decided. New GGI's (Newbies) who participated in the Campaign Ride. 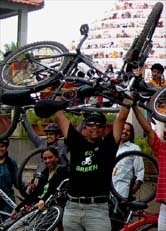 2nd Row.. Shantu with few cyclist @ cubbon park. Snap Shots from the Campaign Ride 14 March 2010.